RIGA - Latvian ports handled 66.17 million tons of cargo last year, which is a 6.9 percent increase on the previous year, according to the Transport Ministry's data. Last year, Latvian ports mostly transshipped bulk cargo – 37.25 million tons (11.6 percent more than in 2017). This amount included 20.87 million tons of coal (18.6 percent increase), 2.56 million tons of chemicals (6.3 percent decrease), 1.58 million tons of woodchips (8.5 percent increase). 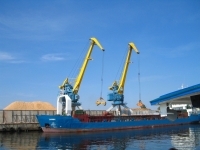 Liquid cargo turnover at Latvian ports decreased 10.9 percent to 15.06 million tons. Oil products accounted for most liquid cargo handled by Latvian ports – 14.16 million tons (12.1 percent decrease). General cargo turnover increased 19.5 percent to 13.86 million tons - container cargo turnover amounted to 4.98 million tons (6.8 percent increase), wood - 4.8 million tons (48.2 percent increase), and roll-on/roll-off cargo - 3.49 million tons (9.5 percent increase). Riga Port was the largest Latvian port in terms of cargo turnover last year, handling a total of 36.43 million tons of cargo (8.2 percent increase year on year), followed by Ventspils Port with 20.32 million tons (1.4 percent up) and Liepaja Port with 7.54 million tons (11.3 percent increase). Skulte was the leader among Latvia's small ports with cargo turnover at 998,500 tons (21.8 percent increase), followed by Mersrags Port – 456,800 tons (4.7 percent increase), and Salacgriva Port – 351,000 tons (31.5 percent increase). The small ports' total cargo turnover in 2018 was 1.88 million tons, an increase of 19 percent on 2017. In 2017, Latvian ports handled 61.877 million tons of cargo, down 2 percent from 2016.